The 2015 Sue C. Boynton Poetry Contest is now mostly complete. The chapbook of winning poems is available for sale at Village Books and the podcast is posted (see link in sidebar at right). 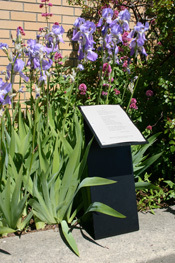 In the coming months, the ten Walk Award poems will be posted in front of the Bellingham Public Library and beautiful placards of all 25 winning poems will find a place inside Whatcom Transportation Authority buses, where they’ll be on view on routes throughout Whatcom County for the next year. Each Sunday, starting tomorrow, we will post one of the winning poem placards on this page and link that post to the Winners page. I once told my husband that making art was not an option, it was a need. I have to make art, I have to use my hands. I believe in craftsmanship, I research every single one of my ideas, draw several sketches, collect images, words and doodles. I throw out several ideas and save what I think are the very best ones. As an artist I collaborate with those around me, seeking feedback and critique. My illustrations have a minimalist style that leans heavily on mark making. I love strong lines that create a visual impact using simple repetitive shapes. I would describe myself as a mixed media artist as my current works are digital, surface and pattern design, illustration, fabric and clay. I received my BFA from Emily Carr University in Vancouver, BC, and I have now made my home in Bellingham for the last 3 years. You can buy my prints, including the ones inspired by the poems in this contest, on Society6, or my handmade goods at Scrappy Carp Living on Etsy. Mat Hudson left art school in the forests of the the Eastern United States to join AmeriCorps, where he served in the Washington Reading Corps for three years and designed many a T-shirt that was a envy of every non Washington Reading Corps VISTA. He sketches directly onto a digital pad connected to his computer and then uses photoshop to modify his artwork. He makes art for Jinx Art Space and the Bureau of Historical Investigation. He is the author of a young adult novel, Hazel, and a picture book, Dig. He lives in Bellingham, WA, where he ponders unicorns and narwhal and finds inspiration in the local music scene. I like to tell stories with art. I love garish and fantastical characters. I enjoy human beings and my art explores stories of human emotion as well as my passion for costumes, colors, textures and intriguing environments. Growing up on the coast of Maine, I was surrounded by stories and images of the region’s folklore. Seilkies, Mermaids, Ghosts and Pirates were all believably real entities to me. My childhood fascination with monsters and supernatural beings continues and influences the way I choose to portray people. I also have a need to express with my art. I become inspired, and have worked hard to train myself to go into a sort of a trance that allows what’s inside to come out. It’s only later that I can look with any objectivity on something that I’ve created and perhaps get a glimpse of what I was feeling or thinking. It is akin to the way one might analyze a dream. I may start a painting or puppet with a certain image in mind, but I allow the original image to change or even get completely painted over whenever I start to see new things. I am often quite confused about how I am feeling until after I paint, draw, or build things and the truth comes to the surface. This is the way I best communicate with myself. In this way I suppose nearly all my paintings are also portraits of my life. Thank you for your interest in my work. I hope that the world I have created sparks your own imagination and provokes many hours of daydream in the years to come.